The Map of Life is a collaborative academic effort to help mobilize and bring together different species distribution data types and sources, providing model-based integration and a system for the community to build upon this knowledge. 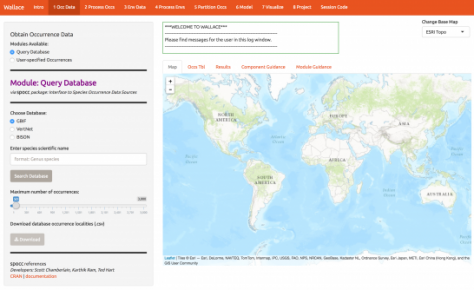 The goal is a knowledge base and platform for species distribution map development, along with a set of tools for querying, accessing, improving and analyzing data. Map of Life is funded by NSF, NASA and other sources, endorsed by the GEO Biodiversity Observation Network, and is guided by an international Steering Committee of leaders in spatial biodiversity science and conservation. The EarthEnv project is a collaborative project of biodiversity scientists and remote sensing experts to develop near-global standardized, 1km resolution layers for monitoring and modeling biodiversity, ecosystems, and climate. The climate layers include remotely sensed data to assist in the interpolation of weather station data across the globe. The land cover layers integrate several independent land cover products derived from diverse remotely sensed data and provide accuracy-weighted consensus land cover information on a continuous scale. In addition, high resolution Landsat images are used to quantify spatial heterogeneity of land cover and characterize its changes over time. High quality, high resolution, environmental data is crucial to understand the environmental controls on biodiversity and the potential impact of global change. See earthenv.org to explore the growing list of available datasets including the 1-km Consensus Land Cover map (Tuanmu & Jetz 2014), cloud cover climatology (Wilson & Jetz 2016), and freshwater environmental variables (Domisch et al. 2015). The funding for this project comes from NASA, NCEAS, and iPlant. Assessments of spatial patterns of biodiversity change are essential to detect a signature of anthropogenic impacts, inform monitoring and conservation programs, and evaluate implications of biodiversity loss to humans. Continental Biodiversity Change Assessment project aims at a comprehensive evaluation of a near half century (1970-2013) of changes in diversity of breeding birds across much of North America. Changes are assessed for different attributes of biodiversity - taxonomic, functional, and phylogenetic diversity - and across a range of spatial and temporal resolutions. To date, the project has revealed significant and continuous increases in all three biodiversity attributes until ca. 2000, followed by a slow decline since, suggesting recent loss of avian diversity. These temporal changes were also associated with increasing biotic homogenization of avian assemblages throughout the US, and were greatest at high elevations and latitudes—consistent with purported effects of ongoing climate change on biodiversity. We are currently evaluating scale-dependence of temporal change in avian diversity to pinpoint the processes driving biodiversity at different scales. Species’ ranges represent the basic unit of biogeography and are fundamental to developing regional conservation plans and understanding ecological and evolutionary patterns. Yet many species’ geographic distributions are known from only a handful of locations, a few surveys, or expert maps. Taken individually, each are incomplete in different ways. We’re developing new statistical tools to combine different types of information on species ranges to yield best possible estimates of species ranges (Merow et al 2016 GEB; Merow et al. 2017 GEB). This will help to improve conservation decisions and inform basic science. These new methods will be used en masse to model 100s of thousands of species for the Map of Life (mol.org) project in the coming years. Range models are among the most widely used quantitative tools in ecology and evolutionary biology, yet there remains little consensus or attention to best modeling practices in the literature. Wallace is new R-based GUI to help researcher understand and reproduce their range models using up-to-date guidance and statistical tools. In combines the simplicity and convenience of a GUI (graphical user interface) with the flexibility and extensibility of code-based analyses. A beta version is available now on CRAN; in R simply use install.packages(‘wallace’).